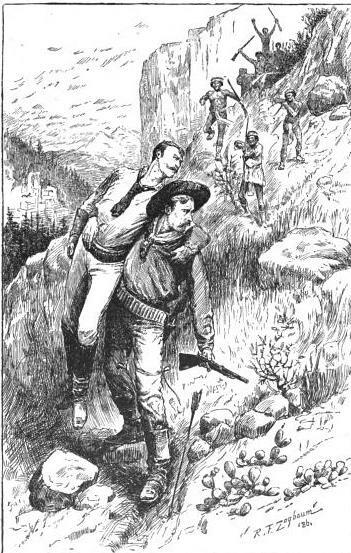 The rescue of Lieutenant Charles King by Sergeant Bernard Taylor during the battle at Sunset Pass in 1874. The Yavapai War, also known as the Tonto War, or the Apache War, was an armed conflict in the United States from 1871 to 1875 against renegade Yavapai and Western Apache bands of Arizona. It began in the aftermath of the Camp Grant Massacre, on April 28, 1871, in which nearly 150 Pinal and Aravaipa Apaches were massacred by O'odham warriors and American settlers. Some of the survivors fled north into the Tonto Basin to seek protection by their Yavapai and Tonto allies. From there followed a series of United States Army campaigns, under the direction of General George Crook, to return the natives to the reservation system. The war culminated with the Yavapai's removal from the Camp Verde Reservation to San Carlos on February 27, 1875, an event now known as Exodus Day. The conflict should not be confused with the Chiricahua War, which was fought primarily between the Americans and the Chiricahua warriors of Cochise between 1860 and 1873.